11.11 is a day set aside to honor those who have served in our military. yes, that was yesterday but since it landed on a sunday, all the veterans get an extra day of national respect. we thank all the men, women and canines that put our country and our freedom above all else. Bailey you look absolutely precious and thank you for honoring the service men and women, canines also, all are extremely brave. 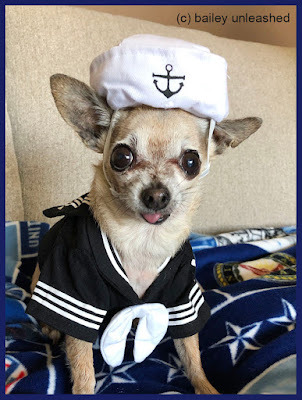 OMD, Ma's Gpa served in the Navy too! Gma was a 'Navy Brat' and even lived on Guam when she was a wee lass. SEMPER FORTIS! 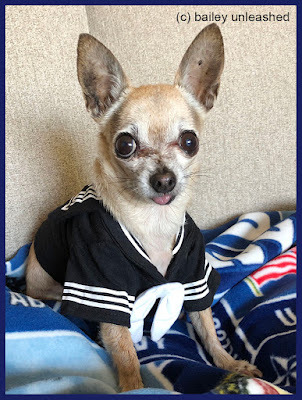 Bailey, you look most adorables in your dress blues! Just like your Pops!